The prevalence of canine obesity increased again during 2017, according to the Association for Pet Obesity Prevention. 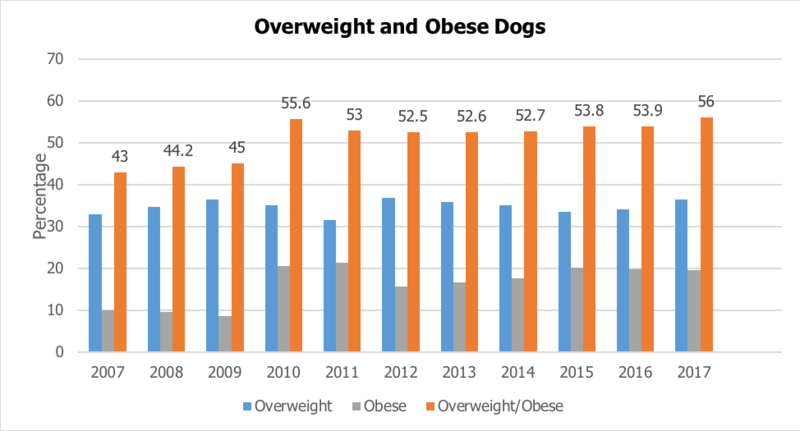 The organization’s 10th annual survey, conducted in October each year since 2007, revealed an estimated 56 percent — the highest percentage yet — of American dogs are considered clinically overweight or obese by their veterinarian. Why are more than half of U.S. dogs overweight and obese? Several contributing factors to the current pet obesity problem have been identified. At its simplest, the prevalence of overweight dogs can be explained by feeding too much tasty, calorie-rich food and treats, which can be made worse by genetics for some dog breeds, and getting too little activity. In reality, the relationship between people, pets and food is a bit more complicated than too-much-food and not-enough-exercise. Just as with people, it’s easy to point to overfeeding and lack of exercise as the culprits for pet obesity. While they are part of the problem, there’s another underlying issue that needs to be addressed: we no longer know what a healthy weight looks like for our dogs. Overweight dogs have become the new normal as a result of how common obesity has become. And it’s led some pet parents to underestimate the true body condition of their dog. What’s a concerned pet parent to do? Schedule a veterinary exam for your canine companion. If you’re concerned about your dog’s weight or body condition, be ready to have an honest conversation with your veterinarian about it. You may not like the answer (Who really wants to hear that their fur-baby is fat?) — but you will at least know so you can take the appropriate corrective steps. Measure how much food you are feeding your dog. This is especially important if your furry friend has access to unlimited amounts of food. If you’re not sure how much your dog should be eating, check the feeding guidelines on the dog food package and talk with your veterinarian. And don’t forget to factor in treats, which are often high in calories! Get your dog moving more and more often. If your dog has been a couch potato, you’ll want to start slowly, gradually building up time, distance and speed. And if your four-footed friend has an underlying health issue, talk to your veterinarian before starting an exercise program. Eliminate table scraps, reduce the amount of food treats and even replace them with other rewards, such as extra playtime, belly rubs, a new toy or petting. A few extra pounds on your furry friend may not seem like a cause of concern. And, sure, having an overweight or obese dog means there’s more to love. But there’s less time to do so. Research has shown that being overweight can shorten a dog’s life span by nearly two years and can negatively affect their quality of life. Talk with your veterinarian today. RELATED POST: Overweight? Big Boned? How’s a Dog Owner to Know?